a large depression of the ground surface produced by thawing of a large area of very thick and exceedingly ice-rich permafrost. a non-dimensional, unitless quantity that measures how well a surface reflects solar energy; ranges from 0 - 1; a value of 0 means the surface is a perfect absorber, where all incoming energy is absorbed, a value of 1 means the surface is a perfect reflector, where all incoming energy is reflected and none is absorbed. a low centered on the eastern slope of the Canadian Rockies in the province of Alberta, Canada. the low pressure center located near the Aleutian Islands on mean charts of sea level pressure during the winter; it represents one of the main centers of action in the atmospheric circulation of the northern hemisphere. refers to high mountain areas above the timber line (where trees cease to inhabit extremely cold environments). 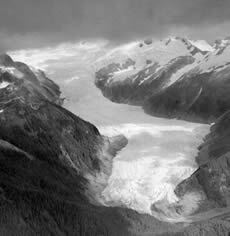 a glacier that is confined by surrounding mountain terrain; also called a mountain glacier. annual accumulations of snow and dust on a glacier. the lowest altitude at which mountain permafrost occurs in a given highland area outside the general permafrost region. the vertical subdivision of an area of mountain permafrost into permafrost zones, based on the proportion of the ground that is perennially cryotic. a principal middle level cloud type (cloud genus), white or gray, or both white and gray, which occurs as a layer or patch with a wave aspect, the elements of which appear as laminae, rounded masses, rolls, etc; these elements usually are sharply outlined, but they may become partly fibrous or diffuse; they may or may not be merged, and they generally have shadowed parts; most of the regularly arranged altocumulus elements have an apparent width of 1 - 5 degrees. a principal middle level cloud type (cloud genus) in the form of a grayish (gray) or bluish cloud sheet or layer of striated, fibrous, or uniform appearance, totally or partly covering the sky; the layer has parts thin enough to reveal the position of the sun; halo phenomena do not usually occur. any wind blowing up a steep incline or mountain; the opposite of katabatic wind. in synoptic meteorology, a detailed study of the state of the atmosphere over a particular region based on the actual observations. submerged ice which is attached to the bottom. an instrument which measures wind speed or wind speed and direction; a cup anemometer measures the wind speed from the speed of rotation of a windmill which consist of 3 or 4 hemispherical or conical cups, each fixed to the ends of horizontal arms attached to a vertical axis; a byram anemometer is a variety of the cup anemometer; a counting anemometer has cups or a fan whose rotation is transmitted to a technical counter which integrates directly the air movement speed; a hand anemometer is small portable anemometer held at arm's length by an observer making a wind speed measurement; a pressure tube anemometer (dines anemometer) is an instrument which derives wind speed from measurements of the dynamic wind pressures - wind blowing into a tube develops a pressure greater than the static pressure, while wind blowing across a tube develops a pressure less than the static, this pressure difference is proportional to the square of the wind speed. a Russian anemograph (recording anemometer) which is equipped with a device to record the wind direction in addition to wind speed. a Russian anemometer combined with a vane to determine the wind direction. an instrument for measuring atmospheric pressure; it is constructed on the following principles: an aneroid capsule (vidie capsule, which is a thin, disk-shaped box or capsule, usually metallic) is partially evacuated of gas, and is restrained from collapsing by an external or internal spring; the deflection of the spring will be nearly proportional to the difference between the internal and external pressures; magnification of the spring deflection is obtained both by connecting capsules in series and by mechanical linkages. deviation of a meteorological quantity value in a given region from the normal (mean) value for the same period. also known as the antarctic convergence; the southern front of the antarctic circumpolar current that separates the antarctic zone in the south from the polar frontal zone in the north; taken by many to delineate the actual northern boundary of the antarctic zone; characterized by sea surface temperatures near 5°6° C and a salinity minimum of 33.834.0 psu produced by high rainfall. the region between the antarctic circle (66° 34′ S) and the South Pole; climatically, the limit of the zone may be set at about 60° S, poleward of which the prevailing westerly winds give place to easterly or variable winds; over most of this region the average temperature does not rise above 0°C (32°F) even in summer. the prevention of ice accumulation of aircraft, ships and other objects; the most common measures are heating or applying a dressing by brush or spray to weaken adhesion and facilitate removal. an ice wedge that grows progressively downwards into a receding slope, in a direction normal (perpendicular) to the surface. area of increased atmospheric pressure relative to surrounding pressure field in the atmosphere; outlined by closed isobars on a synoptic surface chart, and by closed contours on a constant-pressure chart; used interchangeably with high..
system of air movements (atmospheric circulation) associated with an anticyclone, which is clockwise in the northern hemisphere and counter-clockwise in the southern hemisphere. the amount of heat required to raise the temperature of a unit mass of frozen ground by one degree. the cumulative number of degree-days below 0 degrees Celsius for a given time period, calculated from the mean monthly temperatures for a specific station without making corrections for positive degree-days in spring and fall. the cumulative number of degree-days above 0 degrees Celsius for a given time period, calculated from the mean monthly temperatures for a specific station without making corrections for negative degree-days in spring and fall. (from Greek arktikos which means northern) northern polar region of the earth which includes almost the whole area of the Arctic Ocean and adjacent areas of Eurasian and North American continents. mass of very cold air in the arctic regions which invades lower latitudes at irregular intervals. the line of latitude 66 degrees 34 minutes N (often taken as 66.5 degrees N); along this line, the sun does not set on the day of the summer solstice, and does not rise on the day of the winter solstice. (1) the semi-permanent, semi-continuous front between the deep, cold arctic air and the shallower, basically less cold polar air of northern latitudes (2) south boundary of the arctic air mass. haze in arctic regions which reduces horizontal and slant visibility and which may extend to a height of about 10 km; it appears blue-grey when viewed away from the sun, and reddish-brown toward it. a weak high which appears over the arctic basin during late spring, summer and early autumn; one of the centers of action in the atmosphere. a mist of ice crystals; a very light ice fog.